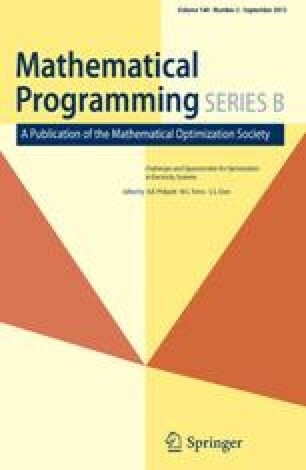 We present computational experience with a cutting plane algorithm for 0–1 quadratic programming without constraints. Our approach is based on a reduction of this problem to a max-cut problem in a graph and on a partial linear description of the cut polytope. This research has been partially supported by Schwerpunktprogramm der Deutschen Forschungs-gemeinschaft “Anwendungsbezogene Optimierung und Steuerung”. Part of the work of the first author was done at the Institut für Operations Research, Universität Bonn, and it was supported by the National Sciences Research Council of Canada and the Deutsche Forschungsgemeinschaft.